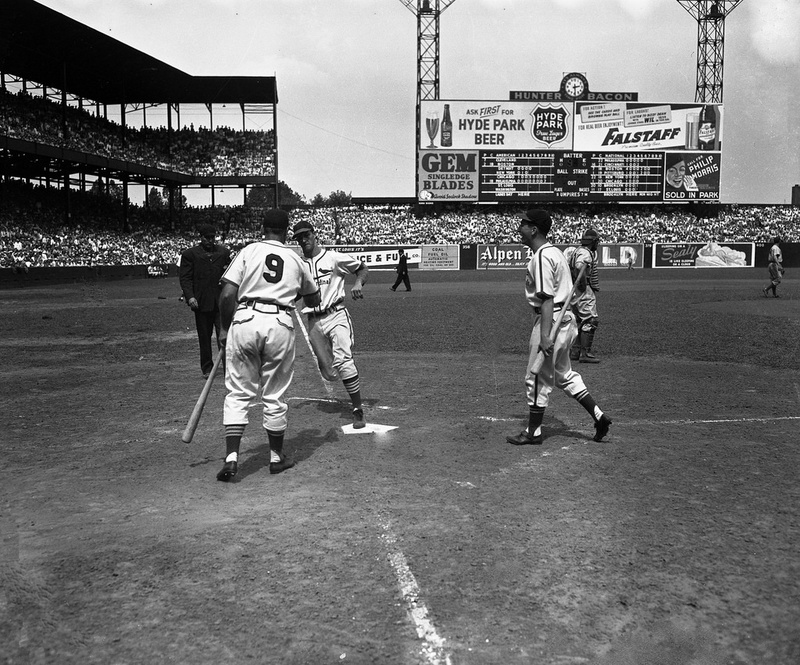 Sunday, August 25, 1946, Sportsman’s Park, St. Louis, first game of a doubleheader between the St Louis Cardinals and the Brooklyn Dodgers. Enos Slaughter and the batboy at right come to congratulate Stan Musial after he just clouted a solo homer in the 4th inning, off young Ralph Branca, to go ahead of the Brooks 2-1. The dejected catcher is rookie Bruce Edwards. This was a big day for Cardinal baseball in 1946, and a virtual sellout, as the Brooklyn Dodgers came into town for a first place showdown – after the Cardinals were behind Brooklyn as much as 7 1/2 games earlier in the season, they heated up after the All-Star break, and both were now tied atop the NL as the day began. And Stan The Man was certainly up to the task – after a year off for military service, he was ready to again dominant the NL, and was flying high in ’46, eventually winning the MVP by leading the league in most offensive categories (except, ironically, HRs and RBIs). And the Cards sure liked their chances in Game 1 – Branca, only a spot-starter in ’46, was facing the Cardinals All-Star ace lefty Howie Pollet, who would eventually pace the NL in wins and ERA. Fortunately for Brooklyn, the wily Branca held his own, and although he was lifted in the 6th after the Cards tied it at 2-2, a parade of relievers deftly held the Redbirds scoreless from there; and as pinch-hitter Cookie Lavagetto broke the stalemate to single in the go-ahead run in the 9th off Pollet, who went all the way in the loss, the Dodgers prevailed 3-2, moving up a full game on the locals. 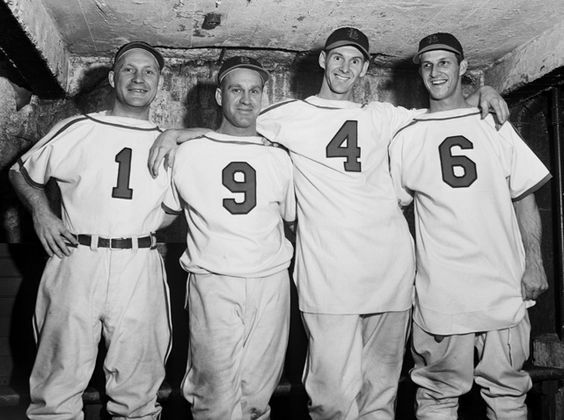 However, the Cardinals and Musial weren’t about to let Brooklyn gain any more ground in their home park, and busted out early in the second game, knocking Joe Hatten out of the box with none retired in the first, and didn’t stop there, building a 10-0 lead after 6 innings, with MVP Stan going 4 for 5 to highlight the Redbirds’ attack. The Dodgers did storm back, scoring 4 in the 7th and 4 more in the 8th to get to within 11-8, but they were running out of time – darkness was approaching, and although Sportsman’s Park had had lights installed in 1940, the rules of the day did not allow for a day game to be continued into night with the aid of lighting – so when the Cardinals decided to score 3 more runs in the bottom of the 8th, the last vestige of daylight was exhausted, and the game was called after 8 innings due to darkness – and the Cardinals regained a first place tie with the visitors, thanks to at least a little help from Mother Nature. So after 6 hours of NL titans doing battle in front of a full house of rabid Cardinal fans, one more or less a pitching duel, the other a slugfest, the result was a No Decision, or as the NY Times put it, “Condition unchanged, patient still feverish”. The Dodgers had two more games in St. Louis in the series, and split those, leaving town still tied for first. It turned out that each game did matter from here on in, as the Dodgers and Cardinals continued to battle down the stretch, and they both ended the season in a flat-flooted tie, surprisingly, for the first time in baseball history. There would be a 3-game playoff to decide the pennant, which oddly enough, had many parallels to that August stalemate doubleheader. The first playoff game was held in St. Louis. The pitching matchup? Ralph Branca vs Howie Pollet. Lady luck had spun the same combination as back in August, and would the stars again line up for the Dodgers against the Cardinals’ ace? As it turned out, Pollet again allowed 2 runs in the middle innings, but didn’t give up that 3rd run in the 9th, and went on to notch his 21st win of the season (the first time being able to go beyond the usual amount of games to add to one’s season totals), and Branca didn’t get out of the 3rd inning, ironically suffering his first loss of the entire season, and the Cardinals took the first game 4-2. The second game moved to Brooklyn, and, pitching for the Dodgers: Joe Hatten, the Game 2 goat back on that summer’s day in St. Louis. Hatten did make it out of the first inning this time, but not much further, as the Cardinals had 5 runs by the 5th inning, and the pennant was more or less lost, although the Brooks had the bases loaded in the 9th down 8-4, but Howie Schultz struck out to give the title to the Redbirds. Ironically, although the Dodgers lost a tough pennant battle in the campaign of 1946, that year set the stage for the future, and young stars such as Branca, Reese, and rookie Carl Furillo (not to mention the addition of Jackie Robinson in 1947) would lead Brooklyn to many years of success in the late ’40’s and ’50’s, including the pennant in 1947 and 6 within the next 10 years, while for the Cardinals, although Stan Musial was one of the best players in the league in the late ’40’s and ’50’s, 1946 was the last hurrah for the Redbirds until the 1960’s. Ironically, Howie Pollet would lose Game 1 of the ’46 World Series, and was removed due to injury in Game 5, although the Cardinals did win the World Championship in 7 games over the Red Sox – who would not win a title until almost a half century later. Joe Hatten, who actually had a pretty good year in 1946, would rebound to go 17-8 for the pennant winners in 1947 and continue to be an effective starter for Brooklyn, although did poorly in the spotlight of both the 1947 and 1949 World Series. An interesting footnote regards Brooklyn catcher Bruce Edwards; he had just been called up in June, but became the Dodgers starting catcher right away, and for the rest of the season. He would go on to play a career high 130 games as the Brooklyn catcher in 1947 (one of his backups would be none other than rookie Gil Hodges, who thankfully moved to first the following year), but the breaking of the color line relegated him to part-time status in 1948 with the emergence of Roy Campanella. He would remain Campy’s backup through mid-1951, when he was traded to the Cubs. He remained a part-timer for the rest of his career. And one final note: The next time the National League ended in a tie, necessitating a playoff, was in 1951, with one Ralph Branca also involved. Let’s just say Branca winning playoff games was never in the cards.